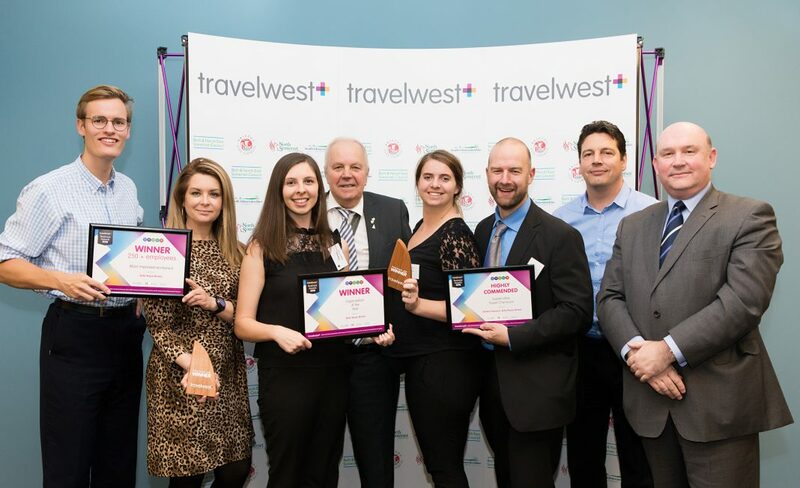 The annual Travelwest ‘Business Travel Awards’ took place on Thursday 29 November at the UWE Exhibition and Conference Centre in South Gloucestershire. The awards recognise exceptional projects and outstanding businesses in the West of England whose commitment to sustainable travel make them stand out from their industry peers. Organisations from across the four regions within the Travelwest partnership (South Gloucestershire, Bristol, North Somerset and Bath & North East Somerset) were celebrated for their success throughout the evening, which also included presentations from industry experts. A record number of businesses competed this year across a range of categories, showcasing the multiple ways that travel modes can be influenced to have a positive impact on health and the environment. The selected winners are organisations and individuals that were judged to have shown outstanding commitment to sustainable travel, with an emphasis on organisations who are leading the business sector into a sustainable future. In South Gloucestershire, noteworthy results included Rolls Royce (Filton) who were awarded both ‘Organisation of the Year’ and ‘Most Improved Workplace’ (large) along with being highly commended in the ‘Sustainable Travel Champion’ category. North Bristol Suscom were highly commended in the ‘Long Term Commitment to Sustainable Travel’ category and South Gloucestershire Council’s Transitions Team (who provide travel training to young people with physical and/or learning difficulties and special educational needs), were highly commended in the ‘Most Innovative Travel Measure’ category. South Gloucestershire Council’s Cabinet Member responsible for Transport, Cllr Colin Hunt, said: “Congratulations to all of the very worthy nominees and award winners. South Gloucestershire is proud to be the host for this year’s awards, and it is great to see so many organisations from our region in the running, not to mention the success of Rolls Royce winning ‘Organisation of the Year’ and ‘Most Improved Workplace’, and the council’s own Transitions Team being recognised.